My oldest car model is this Lancia Beta, that I bought in 1987. I don't recall the reasons for buying it, but back then that did not matter much! 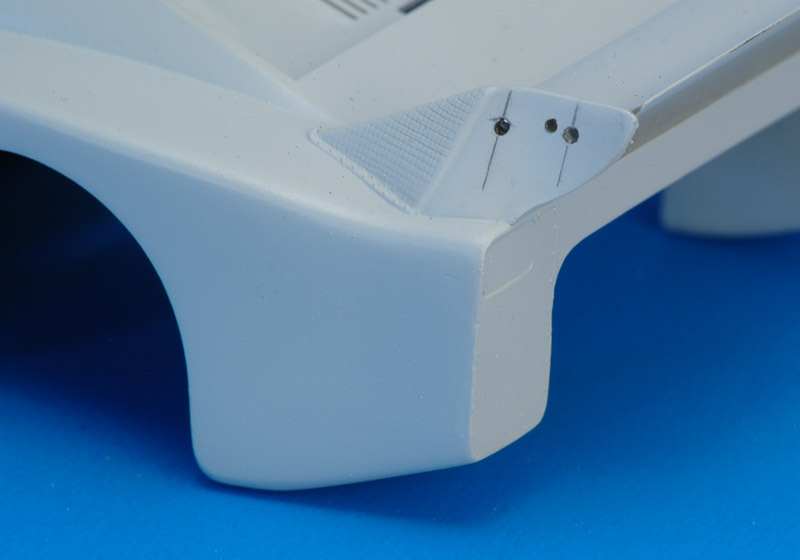 For its time it was a highly detailed model (more than 100 parts), and its clear body parts made it something special ('Crystal' is the trade term for virgin clear styrene). The model is pretty rare now, and I spotted one on Ebay late 2014 that sold for 250$. 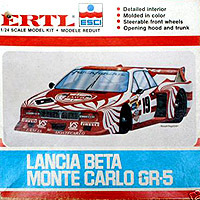 Three versions of this Esci model existed: first the 'Lancia Beta Alitalia' rallye car was issued, followed by the 'Lancia Beta Monte-Carlo Gr 5' in a red-white scheme with a modified nose and tail, as raced during the 1980 season. 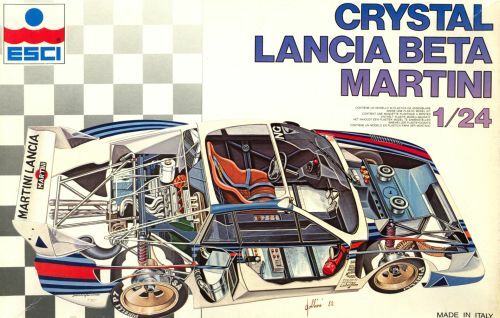 The 'Crystal Lancia Beta Martini' with a clear 'Crystal' body followed in (probably) 1983, representing the car raced in 1981. All three are marked as 'Up to stock exhaustion' in the 1985 catalog, and are absent in the 1986 catalog. 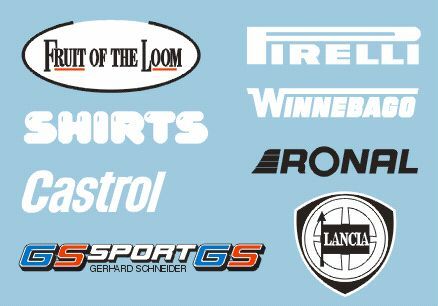 An overview of all liveries can be found on the fantastic Racing Sports Cars site. At least one version was also sold by Revell, probably as Revell-Esci, with just the company logo added to the box. The Esci model was also sold in the USA by Ertl, in a new 'square' box. The Martini version was re-issued by Heller from 1986 on. Heller added a raised 'Heller' symbol on the underside of the fuel filler position. This suggests that the mould was sold to Heller, instead of Esci supplying injection moulded parts for repackaging. Reportedly it was produced with a softer plastic type compared to Esci, also more warping is reported along with less clear windows. The decals are of much reduced quality compared to Esci. I did most of the construction work a very long time ago, when my experience was very limited, and hence mistakes were made. I glued the engine cover to the cockpit section, because the engine cover was badly warped, and wouldn't fit properly against the body. It's quite a wonder that the assembly isn't twisted now, with the warped engine cover twisting the cockpit. 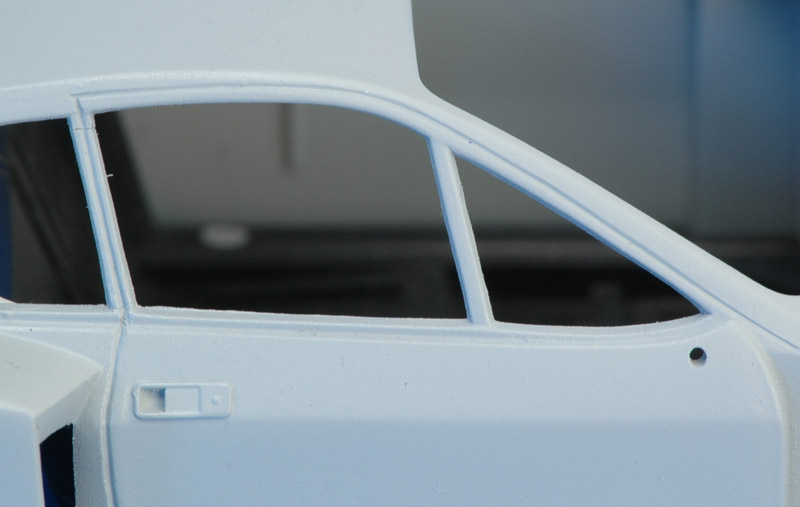 Another modification was performed on the louvres on the front wings. The plastic was scraped thinner on the inside, creating larger openings. However, the modification lacked subtlety, and the louvres are not very regular. I also attempted to airbrush the model gloss white at some point, but the results were quite horrible, and most of it was stripped off again. More recently I did a bit more work on the model. First the problems from the past needed to be solved. More sanding and filling and sanding and filling. The clear body is rather problematic to work with, you just can't see what you are doing. Therefore I sprayed it completely with Humbrol 1 base coat. After some sanding work, and a layer of Humbol 127 light grey, it looked as follows. I still like the shape of this little car! I realised that the door lacked an engraving around the window area, and I scribed it in. Only later I noted that a rain strip was also missing. It will most likely make my engraved line invisible. The rear of the engine cover was one of the areas where I performed near endless sanding, way back. I just couldn't make parts 14, 15 and 16 fit nicely, or the glue joints would fail after some work. Most of that fight is no longer visible, but not forgotten. Long ago I had glued the rear wing to the wing posts, but that would make painting the model difficult. I removed it, and installed 1 mm pins to fix its location while making it removable. Looking back, I should have used a smaller diameter pins. 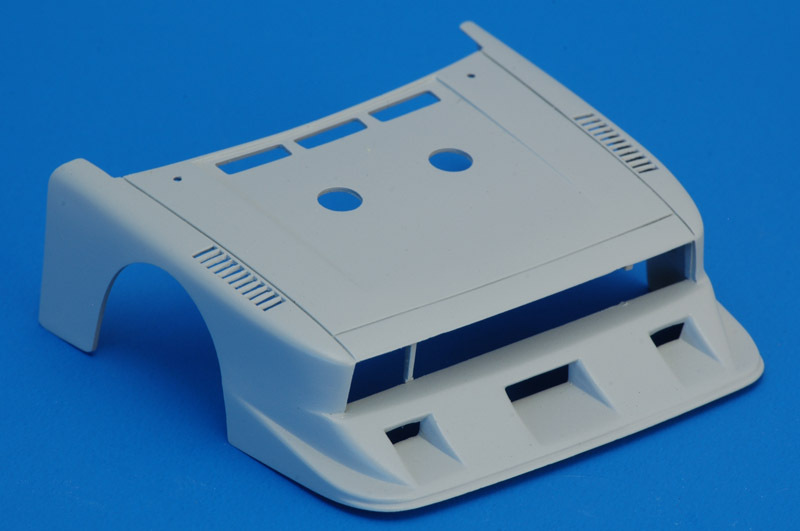 The nose cover was one of the worst parts after base-coating, with bad filling, scratches, shrinkage areas and more problems. I used putty, CA glue and Humbrol 1 as fillers. After a careful sanding it looked like this. The photo also shows an early modification, where I cut away most of the head lamp area, that strangely lacked detail. 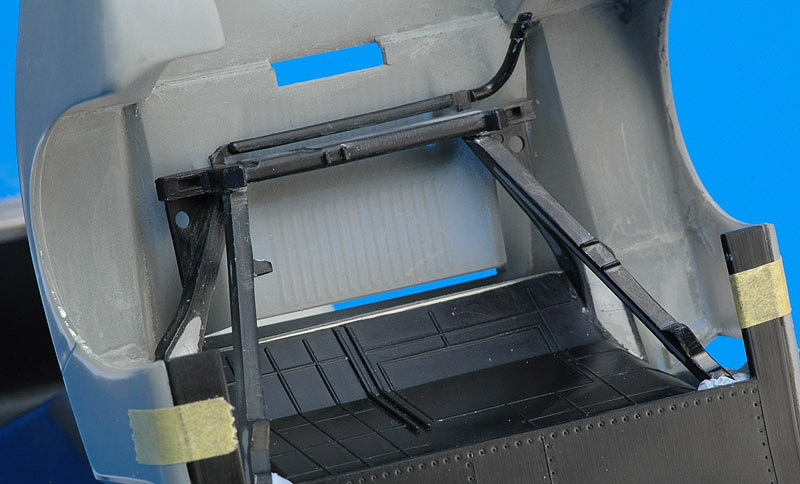 Compared to photos, the leading edges of the three inlets in the air dam sit too low and too far forward. The other edges should be more rounded too. The engine bay shows lots of parts filled up with putty, since they suffered badly from mould shrinkage. And I broke the anti-roll bar. But the level of detailing is quite nice, I think. 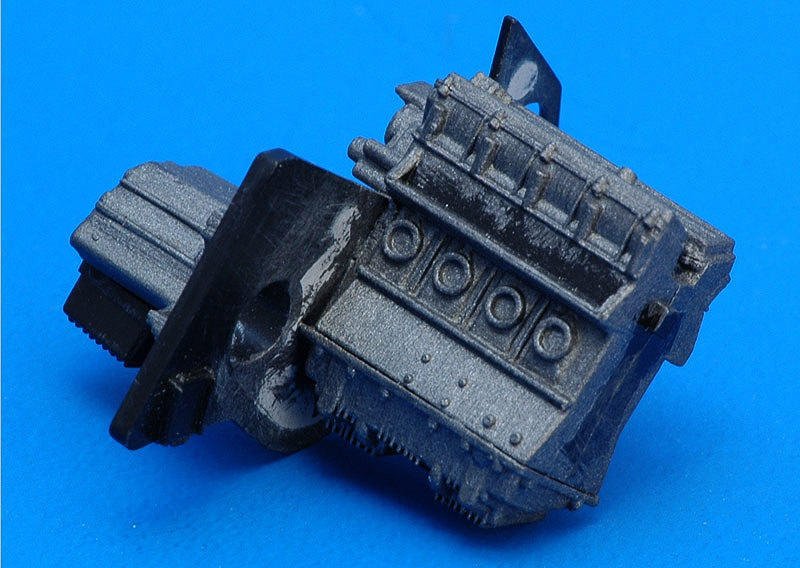 The engine was assembled at an early stage, and handpainted it either Humbrol gun metal or Revell H91, I don't recall exactly. No more work was performed on it since. Other modifications necessary are NACAs inlet ahead of the front wheels, and black strakes on the sides of the hood. Apart from the decals, the wheels will present another problem; they look very complex and I don't think any other kit has them. Shown below is a set of photos of the real wheels. They have 20 spokes, and I think (but haven't measured) that the dish + spokes part is almost identical in size for both front and rear wheels. For the record: Esci's wheels are 15" and 18" diameter (deducting approximately 1.6" for the tire retaining lip). In April 2003, the wheel problem was partly cracked, when Kin-Chun Fong (Gary) wrote me that the wheels were 'Ronal' wheels. This Scala 43 page shows four different Ronal wheels of a similar style. John Cully commented that Ronal wheels were used on a large number of 1980's German Group A racers, like the BMW 635, Ford Sierra XR4Ti and RS500 and others. Kin-Chun Fong then proceeded to find a number of 1/24 kits that had wheels similar to the Beta's Ronal wheels: The Hasegawa XJ-S TWR racer has BBS wheels with 15 spokes, Fujimi has a wheel set (19147), Renaissance (France) issued a resin wheel set (24073) that has some similarities, and lastly the Fujimi Dome Zero (1979 Le Mans), which has 16" rear wheels with 18 spokes. The wheels in these kits are close, those of the Dome probably the closest, but none are real Ronals. The Dome wheels will be difficult to convert into 15" front wheels especially. 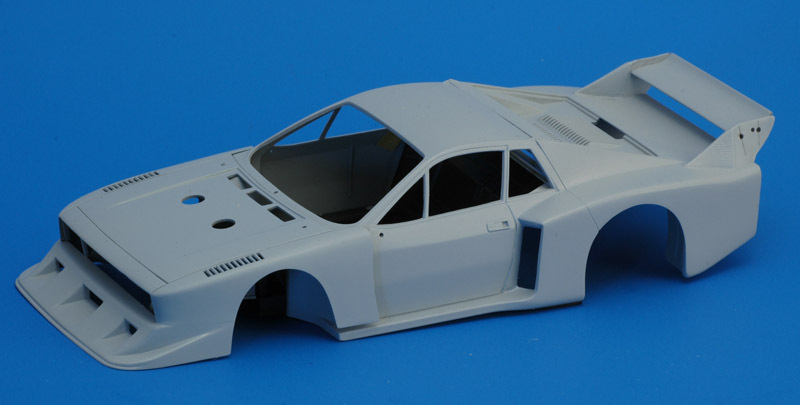 John Cully reported that Monogram kit #2287 BMW 635 'Group 2' has a set of typical 'discs' of a Ronal type design. The search continues! This Pontiac Firebird Trans-Am site has a very extensive listing that I need to study some more to find the best suitable wheels. It's possible that I need 1/32 wheels for my Beta? In 2013, Renaissance Models issued a set of Roues Ronal 15, ecrou central, 24RON2, that come close but are still not 100% correct. In 2016,	Asuka Model from Japan announced '1/24 Euro Style White' wheels in its 1/24 Orange Wheels series. Catalog number is OW-10 for the unplated version, OW-11 for the plated version. Although not identified as such, these look a lot like Ronal wheels. They can be built as 16 and 17 inch versions (~18 and ~19 mm as measured over the flanges that retain the tire, the flange diameter is larger than the wheel diameter). Hobby Search lists them with photos. I found a photo in Modell Magazin 6/84 that shows an Esci Lancia modified just like I plan to do. The model was built by the 'WMS Modellbauteam Düsseldorf" according to the caption.